Local Nielsen ratings snapshot (Thurs., April 28) -- feeling a draft on the first day of the May "sweeps"
The NFL’s annual beef-on-the-hoof selection show, also known as The Draft, made another big ratings impact Thursday night on ESPN and the NFL network. Running from 7 to 10:45 p.m., the 31-team first round (New England had its pick taken away by “deflate gate”) averaged 240,802 viewers on ESPN while NFL Net tacked on an additional 99,154. Among advertiser-coveted 18-to-49-year-olds, the numbers added up to 152,434 viewers for ESPN and 47,636 for NFL Net. The Dallas Cowboys selected Ohio State running back Ezekiel Elliott with the No. 4 pick at 7:38 p.m. From 7:30 to 7:45 p.m. (Nielsen measures in 15-minute increments), ESPN’s audience inflated to 318,708 total viewers and NFL Net’s to 134,566. In the 18-to-49 age range, ESPN had 171,488 viewers from 7:30 to 7:45 p.m., with the NFL Net clocking in at 73,041. Let’s break this down a little further under the assumption that a lot more men watch the draft than women. And that assumption would be correct. We’ll use just the ESPN numbers and measure for each gender in the key 18-to-34, 18-to-49 and 25-to-54 age ranges. Thursday’s top two non-draft draws in total viewers were CBS’ 7 p.m. episode of The Big Bang Theory with 347,038 and Fox4’s local 9 p.m. newscast (262,049). In the 18-to-49 demographic, Big Bang likewise led with 130,204 viewers while the runner-up Fox4 newscast had 88,920. In both cases, Fox4’s news impressively trampolined off a meager lead-in from Fox’s 8 p.m. episode of American Grit, which had 56,659 total viewers and 22,230 within the 18-to-49-year-old motherlode. 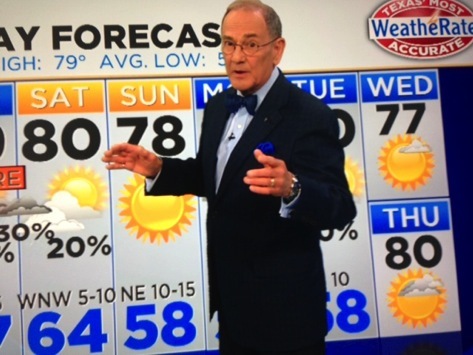 Thursday also opened the four-week May “sweeps” ratings period, with CBS11’s 10 p.m. newscast striving to suction in viewers with the twin punch of former TEGNA8 chief forecaster Troy Dungan in front of a TV weather map for the first time since July 18, 2007 and Ginger Allen’s investigation of “Exploding Toilets.” Dungan also was in studio to plug his new Bible teachings book Jesus Makes Salsa by the Seashore, which unclebarky.com detailed last month. None of this quite panned out for CBS11. The station ran behind TEGNA8, Fox4 and NBC5 (in that order) among total viewers and also placed last with 25-to-54-year-olds (main advertiser target audience for news programming). Fox4 was No. 1 with 25-to-54-year-olds while NBC5 and TEGNA8 tied for second. Here are Thursday’s other local news derby results in the major four-way competitions. Fox4 notched twin wins at 6 a.m. and NBC5 swept both the 5 and 6 p.m. competitions.